We are pleased to announce that we have been offering showers, laundry and lunch to our guests and new friends that are experiencing homelessness. The current days available are Wednesdays and Fridays from 12-4ish. This is such a necessary piece to the puzzle for our guests to be able to get jobs, fellowship with others, staying nourished, and well, just a little time to feel “normal” for a while. We have some needs in order for us to be able to continue this piece of the ministry. Our guests do not have a lot of clothing, so we would love to have t-shirts and sweatpants/pajama pants for them to keep at The CROSS (they will be labeled and stored separately). This would allow them to have something clean to change into after they get out of the shower while their clothes are getting washed and dried. Some of our guests have a need for flip flops/slides so if anyone wants to help with that mercy item, they would be very grateful. There are also times when new guests come in and do not have a backpack so that would be another mercy item. Since our guests are out in the heat and sun, ball caps would be appreciated as well. Finally, we would LOVE to have help with providing lunch for these two days. (Hoping to add more eventually.) Two of us have been the sole providers since the end of the season and while we don’t mind, we would be very thankful for your help! You can message us on FB or email us at codepurplesussexcounty@gmail.com if you would like to help us provide lunch for our guests. Items can be dropped off to The CROSS at 703 East King Street, Seaford, DE 19973. Lunch is also served at this location. The lunch is served at the same location. It is only available to people experiencing homelessness at this time. Please look for further updates on this piece of our ministry. We will have ongoing needs and praise reports. This is an awesome time to come serve with us in a more mellow setting. This is an opportunity to “get your feet wet” and see if this is where the Lord is leading you to serve! We will open tomorrow, Tuesday March 26, 2109 and Wednesday March 27th in Seaford for men (St. Luke’s Parish Hall) and Bridgeville for women (Gateway Fellowship). We will serve dinner at The CROSS (703 East King Street, Seaford) at 7pm. Must be checked into the shelters by 9pm. This looks like the last time that the temps will be under 32 degrees this season. We appreciate all that you, the community, has done to keep us open and operating smoothly! Our guests have been fed well and more importantly loved well! As March warms up, we wind down at Code Purple. We are always sad to say goodbye to our guests that we have grown to love as our very own family. We will be open tonight (18th) and tomorrow night (19th) in Seaford (men) and Bridgeville (women). The temps beyond that are all above 32 degrees. We are so grateful to everyone that has poured into our ministry this year. Please continue to pray for our guests as they make their way out into the world. It won’t be easy for some of them. We trust that the many prayers they have received this season have already paved the way for them to find the redemption that God offers. We will be closing locations on different days. Please see below for a list of shelters and availability. Delmar -Renovate Church: Last day is Friday March 15th. Laurel-Nazarene Church: Last day is Saturday March 16th. Milford- Avenue Methodist Church and Nazarene Church: Last day is Sunday March 17th. St. Luke’s (Seaford), Gateway Fellowship (Bridgeville) will continue to operate when the temps are below 32 degrees. We will update the calendar and website as needed. Please keep an eye out for emails from the SignUp Calendar. We will cancel the days that we are not open. Those days are labeled “OnCall” because we may or may not be open. Georgetown Presbyterian will still continue to be open nightly under their emergency shelter direction. Immanuel will also continue to operate nightly through April. We would like to thank everyone that has served alongside of us this season. We thank the ones that are still serving through these last few bitter nights. We can not do it without your support! Even though we are approaching the end of the season, we still have new volunteers stepping up to help us serve those in the community that are experiencing homelessness. We wanted to share one’s testimony after spending last night with the guests in Milford. We love it when people join us and see just how great it is to serve alongside us at Code Purple. Don’t miss your blessing! 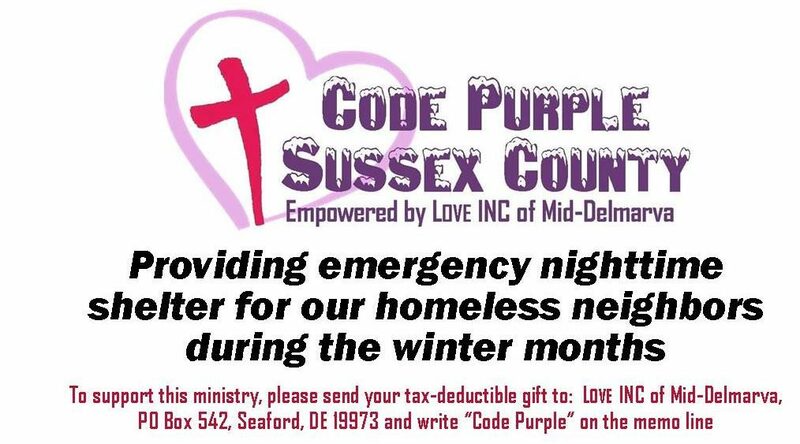 Code Purple was invited to be on Delmarva Life in January. They gave a list of questions that would be given during the interview. I was trying to make sure I was prepared to answer the questions appropriately. It seems that I was overprepared for the time that we actually had in the segment. 🙂 I thought they were good questions and I felt like the answers that I had prepared may be helpful to the people that want to know more about the Code Purple Ministry. What is Code Purple and how does it work? : CP is a collaboration of churches and volunteers coming together to shelter anyone experiencing homelessness in the winter. It started as a grassroots effort and has an established Board of Directors. We are separate from Kent and New Castle County Code Purple agencies. This is our fifth winter in operation. We open in December starting off based on temperatures (32 and below). Then we transition into being open every night from December 15th- March 15th. We invite everyone in need of a safe warm place to sleep, to come in, eat and sleep for the night. Each site has a few slightly different details but basically, we open at 7pm, eat dinner and then proceed to the shelters where the guests sleep. A few of the shelters have dinner on site. Where are these shelters set up? : The shelters are all set up in churches that have generously allowed us space for our guests. We have sites in Seaford, Bridgeville, Laurel, Delmar, Milford, and Georgetown. Some are in fellowship halls and some are in the church basements. Talk about the need for these shelters? : The need for shelter beds in Sussex County is huge. There are currently two year-round shelters and together they hold approximately 30 people. We served over 150 guests last year in just four months. There is an obvious lack of resource in this area. Who can use these services? : Anyone that finds themselves without a place to sleep at night is welcome at our shelters. Whether they have been experiencing homelessness for a day or chronically over years, they are welcome. No matter what they are going through in their lives, they are welcome. We are a low barrier shelter provider which means that anyone not able to get into a shelter due to lack of ID, addictions, mental illness, or other circumstances will have a safe warm place to sleep in the winter months. How do you staff the shelters? : Our shelters are fully run by volunteers. People in the community that give their time and resources to help us run one season at a time. We have training available before the beginning of each new season and then we train on the job once the season has begun. Everything is donation based. Even our dinners each night are brought into each location by members of the community. What do you look for in a volunteer? : We look for volunteers that are caring and committed. We want people to be able to be kind, compassionate and not easily offended. We see a lot of hard situations come through and our guests need to know that we care. We may not be able to fix many problems with the limited amount of time with our guests but many just want a listening ear. We need our volunteers to be patient and have some understanding of the amount of crisis that comes with experiencing homelessness. What kind of time commitment is it? : That really depends on the job that you are signing up to fill. The longest hours are overnight. That would be from about 8:30pm til 7/7:45am but you are allowed to sleep if you are comfortable with it. The intake position is about 2hrs of a commitment. Dinner is the time that you put in to cook and take it to the shelter. Some people drop off dinner but most stay and serve and fellowship with our guests. Fellowship is an important part of what we do in CP. Sitting, eating, sharing stories, and listening are some of the best moments of the season. It truly becomes family time. For those who cannot volunteer, how can they help the shelter? : For those who cannot commit time to be at the shelter, there is always a need for donations. We have a complete list of items as well as drop off sites in several towns. We depend on the generosity of the community to keep our shelves stocked with the needed items to run CP. First, we want to say thank you to everyone that has helped us so far this year. We couldn’t have made it this far without you! We have 3 months left and we need a lot more help! Honestly, we have struggled some with getting help this year. We realize that with the holidays that it is hard to help if you are out of town. Our hope is that with people arriving back home, they will be able to sign up and help out where needed. Please go and sign up! There are few of us coordinating and we also have families and jobs. We will probably not get around to reaching out to you personally. That is the very reason that we have the calendar available. If you have never volunteered before, DON’T WORRY, we will have someone on site to walk you through your first time volunteering. Many blessings to everyone that serves alongside us to make Code Purple the ministry that God has called it to be.